* These extremes include: the North and South Poles; the Marianas Trench and/or another significant point on the ocean floor; or, the top of one of the world’s tallest mountains (e.g., Everest or K2). Bulazel has pledged up to $100,000; i.e., he will donate $25,000 for each of the first four alumni (including Hensel) who takes a picture with our burgee at one of these places. Contact us at [email protected] if you are going somewhere that might qualify! If you want to hear more about Hensel’s experience — or simply learn more about life at the South Pole — I highly recommend her blog: https://henselbelowzero.wordpress.com/. 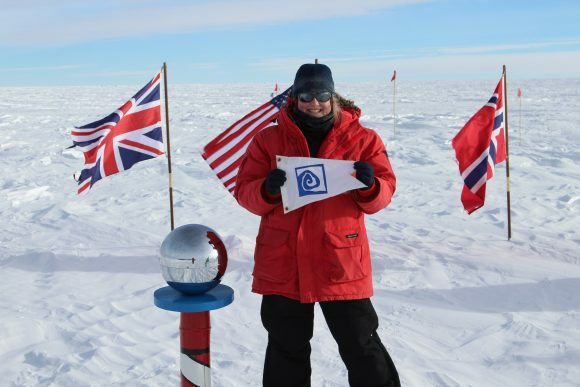 If you want to embark on a South Pole journey of your own, Hensel says she would be happy to hear from you; you can reach her at [email protected].